Just read about it being available and sure enough a check software update show it as available. Downloading now from Naperville, Illinois. I just read about it also. Downloading now! It's a nice surprise - the HTC software updates page has said "development" while the other carrier versions have said "certification" for a while now. I also didn't know we were getting extreme power saving mode. Updated my One, now cannot send text messages, but can receive? Help!!!! Hate the blue on top of the messenging. How do I change that? Go to Settings - Personalize - Theme. Updated M7 with Sense 6, but can't find the Image Match functionality. Can anyone assist? Let me rephrase, does anyone else (M7) have access to the Image Match functionality post Sense 6? Yup. 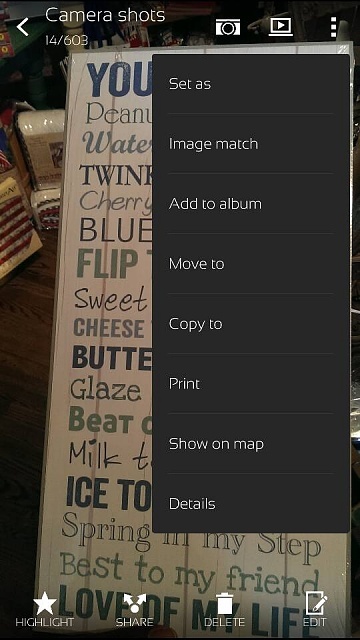 Tap on a picture, then go to the menu and the option is there. This is what I'm seeing on mine. I don't know if I have something enabled that brings that feature; it was just there after the update. Did you upgrade using the OTA update or did you manually update (i.e. as instructed here: http://www.ibtimes.co.uk/how-update-...ware-1450776)? I updated OTA. How did you update yours? Also OTA. A bit irritated with HTC support. One guy told me it's not supported, now they tell me they can't verify whether it is supported. As mentioned, Gallery is showing new theme, just this feature that's missing for some odd reason. That's really weird. I don't think it's dependent on any setting. Just saw there's an update to the HTC Gallery app. Try updating it and see if it appears for you afterwards. Can't open photos sent with HTC mail app. kyocera rise c5155 stuck saying "android is updating..."